Eating Naturally may contact me regarding special promotions and events. 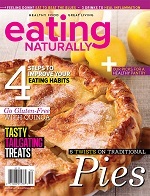 Eating Naturally is published six times a year. Canadian subscriptions include a $11 per year shipping charge, International Subscriptions include a $29 per year shipping charge. All orders are in US Dollard. Subscribers: If the Post Office alerts us that your magazine is undeliverable, we have no further obligation unless we receive a corrected address within two years. Credit/debit cards are subject to card approval. For Further Assistance contact customer service at 800-305-6964 (US and Canada) or 651-251-9689 (International).